Eye Reader is an APP that is a reading magnifier. It uses the LED light of the IPhone. The APP is only for IPhones and is a perfect solution for reading menus or viewing websites on your phone. Here's an APP that so many of us will find helpful-- It's a great way to find the items you lose all the time... your keys, remotes, vitamins, eReader, IPad, you name it. The APP itself is free but you must purchase the tiles, which are tiny blue-tooth trackers. If you're like me, you will find the $20-25/tile well worth the price. You can get the IPhone version at the iTunes APP store or an Android version on Google Play. GLAMSQUAD is a mobile beauty provider delivering professional and affordable beauty services to the home, office, hotel in New York City, Miami, Los Angeles and Washington DC (coming soon)-- I think this is a great service for older women who may not be so mobile and a great way to spend a mother-daughter day primping. While it is APP driven they have real live people to talk to. Once you use it and see how good it is, you'll find it easy to use the APP. Here's a link to a blogpost I wrote on them. In my ongoing search for great applications and other resources for seniors and caregivers, I ran across GreyMatters. It's an exciting and interactive free iPad app that that makes it easy to share memories and stories with family members suffering from Alzheimer's disease or other dementias. Offered by GreyMatters LLC, this app is basically an interactive life storybook that includes preloaded music from past decades, memory games. It lets you add personal family photos with easy-to-read text, and can bring a big smile and a long-lost "spark of life" to seniors who spend their days lost in their own worlds. GreyMatters is providing a wonderful service to families all over the country. I encourage you to download this app, and share your experiences with me. Click here to read a more detailed description of this App. If you or a loved one has High Blood Pressure (HBP) this could be a great App. To make it work for you, you must have your own automatic blood pressure monitor. (I recommend that you bring it with you when you go to the doctor and make sure your machine and theirs is in sync. You can use this to track your blood pressure, weight and pulse and you can even send it to your doctor- It not only gives you peace of mind, but also can eliminate unneccessary doctor visits. Breathing Zone is a doctor recommended therapeutic breathing exercise. In just 5 minutes you can start to reduce stress and anxiety and improve your mood. Used daily, Breathing Zone can help manage high blood pressure. It's available for both Mac and Android users. Calm is a simple mindfulness meditation app that brings clarity and peace of mind into your life. You can choose from many different sounds and pictures that will help you to relax. You can choose to subscribe to it monthly (9.99/month), annually (39.99/year), or for a lifetime (299.99). You can subscribe on their website or you can download the App from the iTunes store or google+. Medisafe is a Medication Management App-- It is fairly easy to use and is a good tool to either management your own medications OR to help management a parent's or spouse medications. What I like about it is that whatever your caregiving role is, you can adapt the app to suit your needs. It is ONLY for Iphones and Ipads. Care/Mind is a lifestyle/wellness app that is used along with a FITBIT. It allows you to know that your loved one is safe AND staying healthy. It also enables you to stay connected withthem while you're busy with your own daily life. Discover and share your favorite books on this app. It's recommended by 20 million members. It allows users to rate books they've recently read and give brief explanations of their choices. View other users' reading history to see how often they read and their typical genre to find out if you share mutual interests. Click here to view their lists of Best Books for 2016. Keepy allows you to keep all family photos, videos, children's artwork and schoolwork and all mementos in one place in a way that's easy to share with others. One of the most compelling features is that Grandma and Grandpa can enjoy their grandchildrens' creations. Sound Print is an App, compatible with Apple products, that helps you to find quiet and moderate restaurants and other social places, by providing their decibel level of noise. After you download the app you use the internal meter to view the decibel level of restaurants in your community, or you can use the App to measure the restaurant's noise level and submit it to the database for other users to view. It's a great App for all, but especially for those who wear hearing devices. Memo Clock, is an app that allows you to make daily reminders. The way it works is that the app is downloaded on a tablet that can be placed in view of the person with dementia and also on the caregivers smart phone where they can change the message as many times as desired. It may be especially helpful to reduce anxieties seen in some dementia patients. 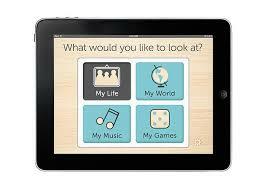 Care Zone is an APP for collating personal health information and is also used as an APP for medication management. It's particularly helpful for family caregivers who are manage a family member's medications who is unable to do it for themselves. Medication management is a stressful aspect of caregiving and thru this App you can create a complete list of medications take and set up a dosing schedule for each medication and set up reminders for your loved one to take them.